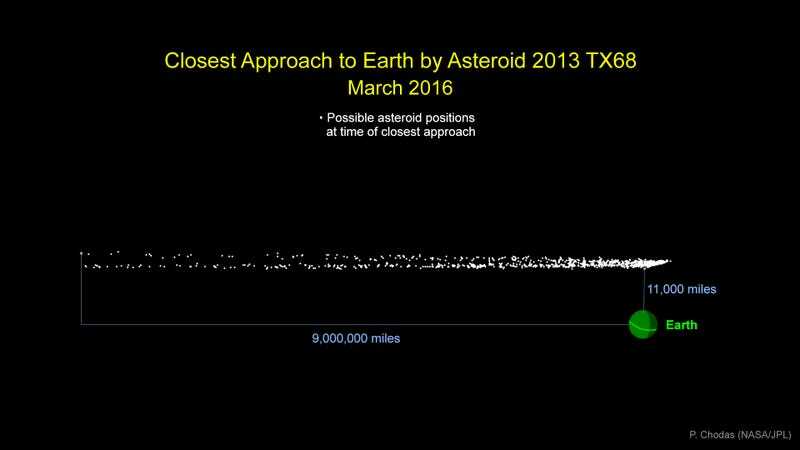 Let’s be very clear here: There is simply no possibility that Asteroid 2013 TX68 will get close enough to hit Earth when it flies by on March 5th. What it may do, though, is come close enough to be visible. What would it look like? That mostly depends on the trajectory the asteroid takes, which NASA researchers are still trying to figure out. The most likely path has it at just over 1 million miles away. But it could also follow a trajectory that spins it much further out so that, even with the aid of a telescope, it would be too far out of range to glimpse at 9 million miles away. But if conditions are just right, the asteroid could come within 11,000 miles, easily catchable with a telescope. Astronomers only discovered the 30-metre asteroid two years ago, and with so little data there are several possible orbits for the rock. Asteroid 2013 TX68 is scheduled to come back around again in September 2017 — and when it does, it will come with a 1:250,000,000 chance of impacting Earth. NASA, however, called the possibility “too small to be of any real concern”.